Implements the Birch clustering algorithm. It is a memory-efficient, online-learning algorithm provided as an alternative to MiniBatchKMeans. It constructs a tree data structure with the cluster centroids being read off the leaf. These can be either the final cluster centroids or can be provided as input to another clustering algorithm such as AgglomerativeClustering. The radius of the subcluster obtained by merging a new sample and the closest subcluster should be lesser than the threshold. Otherwise a new subcluster is started. Setting this value to be very low promotes splitting and vice-versa. Maximum number of CF subclusters in each node. If a new samples enters such that the number of subclusters exceed the branching_factor then that node is split into two nodes with the subclusters redistributed in each. The parent subcluster of that node is removed and two new subclusters are added as parents of the 2 split nodes. Number of clusters after the final clustering step, which treats the subclusters from the leaves as new samples. None : the final clustering step is not performed and the subclusters are returned as they are. sklearn.cluster Estimator : If a model is provided, the model is fit treating the subclusters as new samples and the initial data is mapped to the label of the closest subcluster. 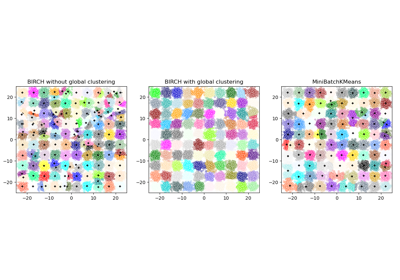 int : the model fit is AgglomerativeClustering with n_clusters set to be equal to the int. Whether or not to compute labels for each fit. Whether or not to make a copy of the given data. If set to False, the initial data will be overwritten. Start pointer to all the leaves. Centroids of all subclusters read directly from the leaves. Labels assigned to the centroids of the subclusters after they are clustered globally. Array of labels assigned to the input data. if partial_fit is used instead of fit, they are assigned to the last batch of data. The tree data structure consists of nodes with each node consisting of a number of subclusters. The maximum number of subclusters in a node is determined by the branching factor. Each subcluster maintains a linear sum, squared sum and the number of samples in that subcluster. In addition, each subcluster can also have a node as its child, if the subcluster is not a member of a leaf node. For a new point entering the root, it is merged with the subcluster closest to it and the linear sum, squared sum and the number of samples of that subcluster are updated. This is done recursively till the properties of the leaf node are updated. fit(self, X[, y]) Build a CF Tree for the input data. partial_fit(self[, X, y]) Online learning. predict(self, X) Predict data using the centroids_ of subclusters. transform(self, X) Transform X into subcluster centroids dimension. Build a CF Tree for the input data. Online learning. Prevents rebuilding of CFTree from scratch. Input data. If X is not provided, only the global clustering step is done. 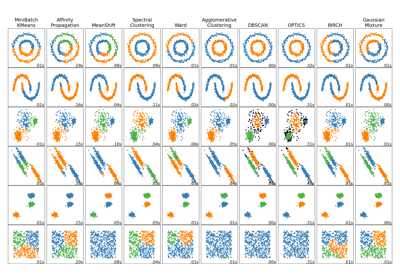 Predict data using the centroids_ of subclusters. Avoid computation of the row norms of X.
Transform X into subcluster centroids dimension. Each dimension represents the distance from the sample point to each cluster centroid.